Moto X+1 Coming With 25 Different Backplates? 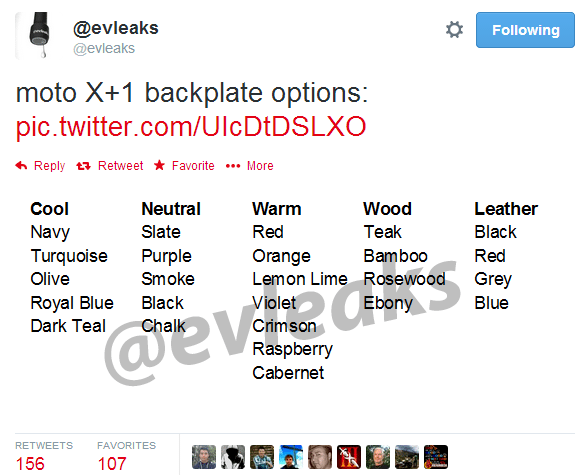 After last week’s leak of Motorola’s next flagship device, known as the X+1 for now, @evleaks is back at it again. Today, the leakster has shared all the types of backplates the Moto X+1 could offer when it releases this summer with a total of 25 different backplates to choose from! The new addition here is leather, aside from more wood options. Remember this is just for the backplate so who knows what else you will be able to customize, if and when Motorola decides to release Moto Maker in Canada. Hopefully we won’t have to wait much longer. The post Moto X+1 Coming With 25 Different Backplates? appeared first on Android in Canada Blog.